Take the Hassle Out of Gardening! 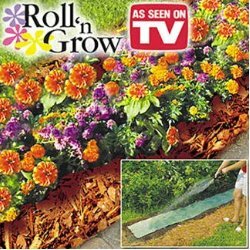 Just Roll Out, Water...And Watch It Grow Introducing Roll 'N Grow, the easy new way to have a beautiful garden without all the hard work and effort. With Roll 'N Grow, it's never been easier to create a beautiful, luscious garden. With your help we can reach more people and let them know about Roll N Grow whether this product works or not. I bought this once and it did not grow, so I thought mabye I did something wrong so I bought it again. Still didn't grow. I thought 3rd times a charm bought one more guess what didn't grow. Had more luck buying a bunch of seeds and throwing them in the ground at least I got flowers from that. Go buy seeds it's cheaper.